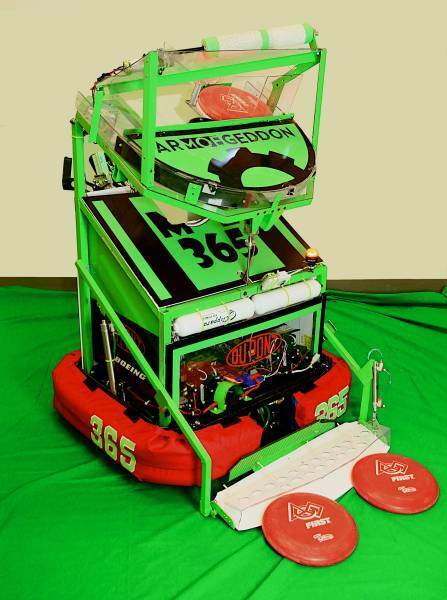 ArMOEgeddon is a bright green and black robot designed to obtain discs from the feeder station or floor. Also, ArMOEgeddon has a very maneuverable drive, a disc pick up arm, and a 10-point climber. Highly maneuverable and fast mecanum drive using 4 CIM motors. High mounted shooter for lower angle shots into goals from a significant distance. Adjustable angle, speed-controlled shooter provides ability to shoot from multiple locations on the field. 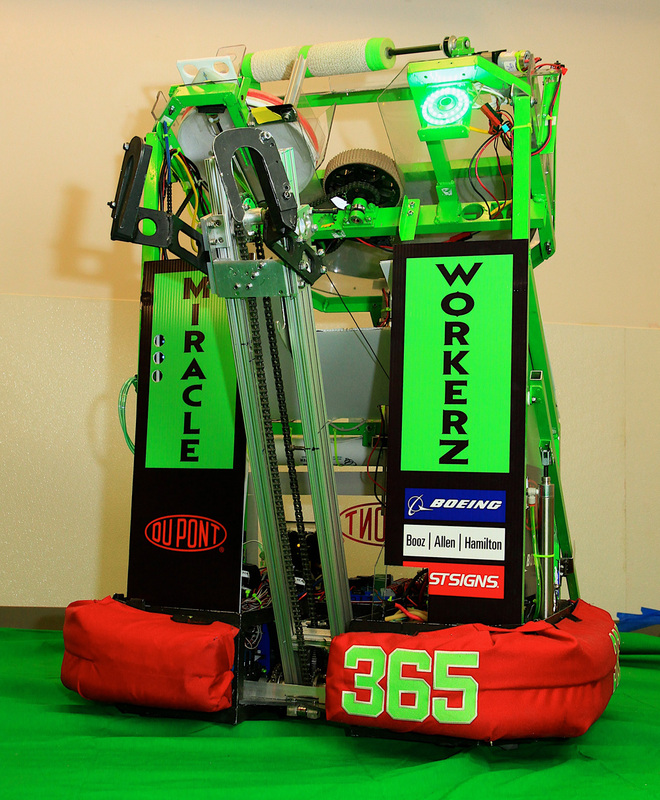 Ability to pick up discs from the floor, two at a time, or obtain discs from feeder station. Ability to push multiple discs across the floor and flip discs that are upside down. Two cameras, one aligned with shooter for automated alignment during hybrid and tele-operated modes, and another focused on floor for disc pick-up. 60" tall bot is effective defense against low shooters. Multiple autonomous modes with 5-disc or 4-disc scoring capability. Fast cycle time between feeder station and 4-disc scoring. Feeder and floor pick-up ability. Height to block low-shooting robots. Have a well-trained scouting team to bring you up-to-the-minute match information.